Isn’t it nice to remember them as you knit? I was very near and dear to both my grandmothers. My paternal grandma taught me to knit when I was very young, and I wish she was still here today to see what I have been able to accomplish in my knitting and to still be able to learn things from. I believe that the Amish still practice this in their quilts today! A mistake left in my work is always a testament to the fact that only God is perfect. I’ve always heard that early American quilters used to make one whole block in their quilts that was “wrong” and did not match for the sole purpose of professing their faith in this belief. 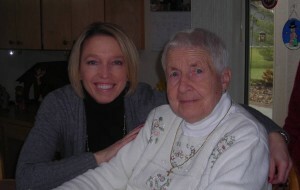 I’m very lucky to have had a grandmother for all my years! Lucky you to have your grandma still so active. Mine died when I was 9 and I only remember her as sick old woman although she was not so old (I always refers to only having one cause the other one was already dead when I was born). On the other hand I remember HER mother´s sister´s – two old lady´s, one of them always knitting with pins at 2mm (my guessing) knitting lovely mittens all with patterns in one color. Best wishes to you and your granny. Grandma is 94. She lives on her own and knits every day. She is my hero! Your Grandma sounds wonderful. You both look very happy to be with each other. i love your grandma’s thinking. this Eazy pattern has had me in tears. ready to throw in the towel, but after many ripped &reknit rows i’m finally at the heel of sock1 must admit don’t care for color combo. maybe color choice good idea for future project. really love the twisted cast on. also loved the stretchyness of the glove twisted cables.